Quick Take: The Big Bang Theory, "The Wiggly Finger Catalyst"
Review: The Big Bang Theory, "The Wiggly Finger Catalyst"
(S0504) Story One! Raj finds a girl he can talk to when Penny introduces him to her friend Emily, who's deaf. Since she can't hear him, his nerves don't take over. Unfortunately, Howard has to translate for their first few dates, but they hit it off and date for several weeks. Raj learns sign language, and buys her all sorts of gifts... and that makes Leonard, and then Penny, wonder if maybe she's a gold-digger. Eventually, his parents make him choose between the money and the girl. He chooses the girl, but she chooses the money and breaks up with him, hence the picture above. Meanwhile, Sheldon has turned over all his incidental daily decisions to the randomness of dice. 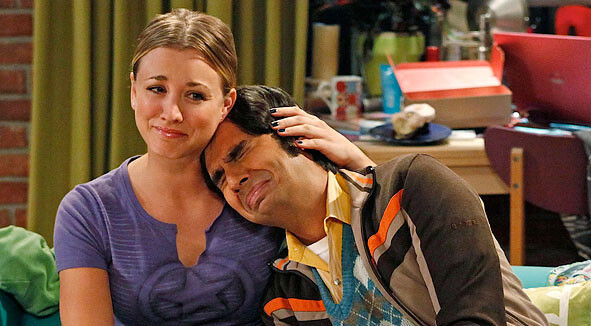 This was a mostly-Raj episode, and as such, it's both sweet and kind of embarassing. He's a good guy, but he's also naive and falls in love far too easily. We can tell, right from the beginning, that it's not going to go well, but it's still sad when it falls apart. It's also funny, but mostly it's sad. The Sheldon part of the episode is kind of like the train bit from last week--there's no greater meaning to it, and there's no resolution in it, but it's fun as hell and it's nice seeing Sheldon being something other than a self-important jerk. It's where a lot of the silliness in this ep happens, since Raj's story is busy being heartwarming and then sad. It's getting a little beyond belief that Raj can't get a break at all, though. If I was writing on this show, I'd introduce someone that he discounts, who later becomes the perfect girlfriend for him, after many misunderstandings and BBT-style awkwardnesses, because the guy is starting to come across as more pathetic than I think they intend him to be. And he's the only one of the boys without at least a foil, so there's a space in the cast. Overall, this was a pretty balanced episode, even if it was focusing mostly on one person. Everyone had lines, and everyone was involved, with no one off-screen. I call that a win! Watch the full episode on CBS.com. Reminds me of the recent Parks & Rec episode where Tammy I is literally a gold digger.